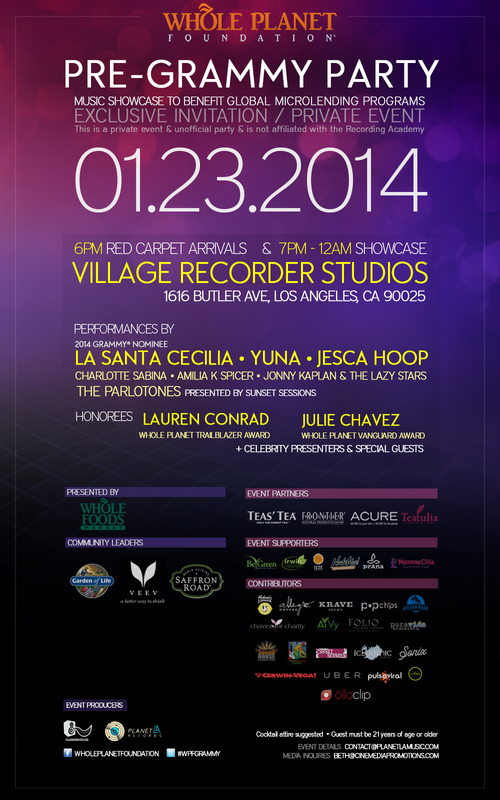 Pleased to support our friends at Whole Planet Foundation , Whole Foods Market and partners for our annual Pre-GRAMMY benefit and music showcase in support of global poverty alleviation on January 23, 2014, at Village Recorder Studios in Los Angeles, California. Presented by Whole Foods Market® and partners and produced by Planet LA Records/Music and Clamorhouse. Scheduled to perform: La Santa Cecilia (2014 GRAMMY nominee), Yuna, The Parlotones, Jesca Hoop, Charlotte Sabina, Amilia K Spicer and Jonny Kaplan & The Lazy Stars. Honorees Lauren Conrad and Julie Marie Chavez. Celebrity presenters to be announced. EVENT PARTNERS: TEAS’ TEA, Frontier Natural Products Co-op, Acure Organics and Teatulia Organic Teas. CONTRIBUTORS: Hubert’s Lemonade, Allegro Coffee Company, popchips, Krave Jerky, Justin’s, Folio wine, Peaceful, Easy Feeling Cabernet, Golden Road Brewing, AiVy Springrolls, Icelandic Glacial Water, Pura Vida Charity Bracelets, Chavez for Charity, VOS Flips, Soapbox Soaps, Cerwin Vega, Olloclip, Pulso Viral, Sonix, Sunset Sessions, Sound House Promotions and Uber Cars. This is an private invitation-only event. Proceeds from the event will go towards Whole Planet Foundation’s global efforts to alleviate poverty through microlending programs in 58 countries. NOTE: This is a private event and unofficial party that is not affiliated with the Recording Academy.